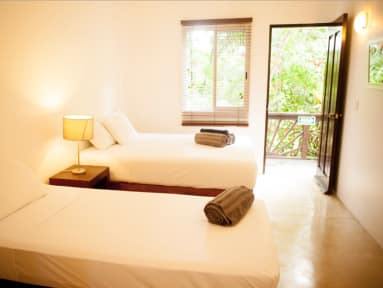 Mango Tulum is a brand new budget hotel in Tulum town. Situated by the main crossroads giving you easy access to the town, ruins, beach and cenotes. A small family run hotel by Orm & Chelley from the UK, both scuba diving instructors and local cavern guides. The hotel has been designed to provide a modern, clean, comfortable environment for you to relax after exploring all that Tulum has to offer. - Our private rooms have extra large king size beds, air conditioning and ceiling fans and modern ensuite shower rooms with hot water. - Our dorms have been designed with you in mind, with a maximum of 4 beds, air conditioning, large lockers and ensuite bathrooms with separate hot water shower, toilet and sink areas. Mango Tulum has a large garden area with swimming pool, Wifi, parking and free tea, coffee and drinking water. Bed linen and towels are also included. Only cash payment accepted on arrival. (Mexican pesos, $USD, Euros). There is an ATM and bank located across the road. (baggage storage is available). Please call or email ahead if you will be arriving late at night or very early morning. Breakfast not included (coffee and tea facilities available). We currently do not have any cooking facilities but are aiming to add this in the near future.